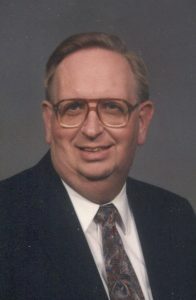 JAMESTOWN, NY (September 11, 2018) – Retired Covenant minister James R. Swan died Thursday, September 6, at the age of 78. He was born on November 22, 1939, in Jamestown, to Paul and Ethel Swan. He graduated from Wheaton College and North Park Theological Seminary. Swan served Covenant congregations in Worcester, Massachusetts; Escanaba, Michigan; and Crookston, Minnesota. He also served as office manager for Bible Radio Network in Pasadena, California, and then as chaplain of the Chautauqua County Jail in New York. The funeral will be held at 2 p.m. on Tuesday in the Lind Funeral Home. Burial will be in the Lake View Cemetery. Memorials may be directed to Zion Covenant Church, 520 Fairmount Ave. Jamestown, N.Y. 14701, or to Samaritan’s Purse, P.O. Box 3000, Boone, N.C. 28607, or log on to samaritanspurse.org. Fond memories of Jim from our seminary days at North Park. We both lived in Burgh Hall for a time, and he would stop by our room to talk theology and Bible, which he loved to do. I recall his impressions of our seminary profs that would have us laughing. I can still see him twirling a basketball on his finger, encouraging us to join him for a pick-up game. I lost contact with Jim over the years, though I had heard he had returned to his beloved Jamestown. Peace to the memory of this seminary colleague and friend.